Friends since they were teenagers, Ketil Bjørnstad and Lars Saabye Christensen, share part of their relationship with the listener on this beautiful album that recounts tales and stories of loneliness, optimism and anticipation of events ahead. In lesser hands, such a concept of setting music to poems can fall somewhat short of expectations, however there are no such issues in this sparkling, and ultimately uplifting recording. The poems written by Lars Saabye Christensen are topic driven, all recounting feelings and perceptions of staying in hotels around the world in such far flung destinations as New York, Melbourne, New Orleans and Hong Kong. Quite what makes such a wonderful album out of "hotel poems" is something of a mystery, but from the opening chords of 'Mayflower, New York' there is a delicious feeling of anticipation of the music to follow. This anticipation is heightened by the empathy between the two performers and their relationship with the songs and the feeling of déjà vu as both Bjørnstad and Drecker are seasoned travellers over the course of their careers. The poignancy of each lyric is superbly interpreted by Drecker, and deftly and sympathetically supported by Bjørnstad's accompaniment. As befits the setting, the pianist's music composed for each poem received from his friend often elicits a feeling of loneliness, that of a lone traveller taking stock of the strange and unfamiliar environment that they will be calling home for the duration of their stay, with a hint of melancholy never far away. This feeling is almost rudely interrupted by the swagger of 'Astor Crowne, New Orleans', that stands out among the solemn readings of the other pieces. 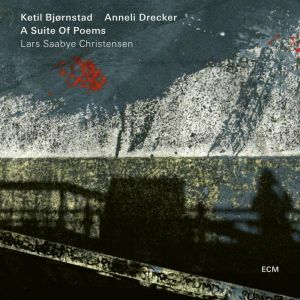 With the exception of the aforementioned 'Astor Crowne' for much of the album remains similar, gently paced with little variation but the attraction of these pieces lie in Drecker's delivery and the voicings that Bjørnstad brings to his writing that make these poems into songs that resonate deeply.